Strawberry season is almost upon us kids. Temecula Valley Strawberry Farm will be opening on March 1st and my Chandler strawberry plant (who is aptly named Chandler) is already blowing up with berries. Chandler has been with me for many moons now and he makes strawberries almost all year long with only a few dormant months in between exploding with berries. He’s a weird one, but I love him and the fruity delights he provides me with. Since he’s only one plant, I always eat the berries as snacks. There are never enough at one time to make any kind of recipe, but one day I hope to have enough space so Chandler can have some friends. Until then, it’s all about farm trips and the far mar for me. I have seen various concoctions for strawberry preserves/spreads paired with hot peppers. I actually sampled a pencil-eraser sized dollop of strawberry-ghost pepper jam that had my mouth pretty steamy for a while. Probably not my first choice for toast, but pretty good all the same. 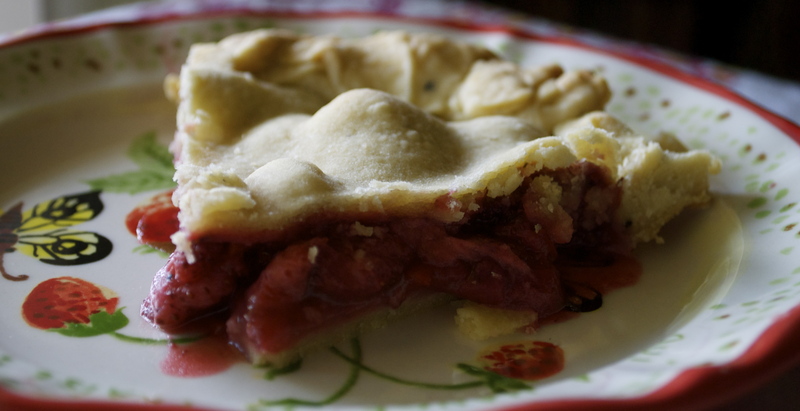 That gave me the idea to bake a Texas Strawberry-Habanero Pie. Strawberries generally don’t make the best pies all on their own because they are so juicy, but I figured I’d give it go and see if I could make the pie work. I’m happy to report that while it was ever so juicy, it was not a soggy mess. Joy. Pie joy. I’m only going to give you a recipe for the filling because I’m annoying. Seriously though, for certain pies you’ll want to have a custom delicious dough. Perhaps for this pie….or for this one! 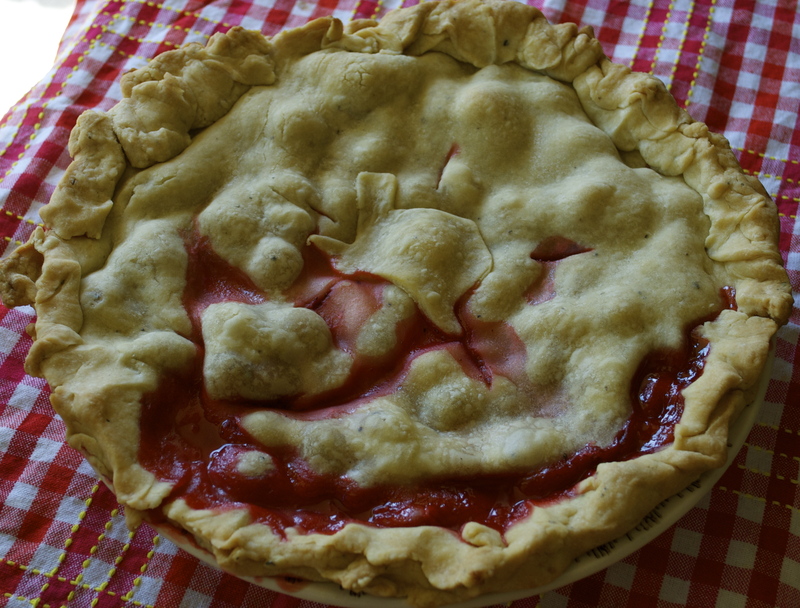 But for this relatively simple Texas Strawberry Habanero Pie, you can use your favorite pie crust recipe. The filling is the sole star of this one, so any simple crust will do. The stars at night, are big and bright! 1 recipe double pie crust–use your fav! Prepare your crusts and have them chilling in the fridge while you prep the filling. Preheat oven to 425°F. Heat a small amount of safflower oil in a small pan. Give the habaneros a quick saute to soften them up a little. You can definitely put them into the pie raw, but your pie will be pretty spicy and they will overpower the strawberries. Once the peppers are done, give them a minute or two to cool off. While the pepps are cooling, combine all of the filling ingredients in a mixing bowl. Add the habaneros and toss to combine. Roll out your bottom crust and line a 8-9″ pie plate. It’s best to use a more shallow pie plate here rather than a deep dish plate. Pour in the filling. Add your top crust remembering to cut some slits for ventilation. Bake at 425°F for about 20-25 minutes then reduce the temperature to 350°F–add a pie shield or foil now if you need one and bake for an additional 25-30 min until the filling bubbling in the center. Let the pie cool completely before trying to slice—well, you don’t really have to do that if you don’t mind eating a hot, runny, albeit delicious plate of pie slop. If you’d like any semblance of a slice though, wait for the pie to cool. ← Possibly Persimmons. Possibly Persimmon Bread. I like the idea of this sweet and spicy mix. Did the heat from the habaneros really stand out?